How the Nokia Browser Decrypts SSL Traffic: A "Man in the Client"
You can find out more about Nokia’s privacy practices at http://www.nokia.com/privacy. How is SSL Decryption Possible? (Note, the connection being made here is an HTTPS connection–that is all that our server accepts). All of this simply confirms what Pandya observed, and what Nokia admitted. But what would cause this behavior? You would expect your web browser to receive certificates for the secure web site that it claims you are connected to. 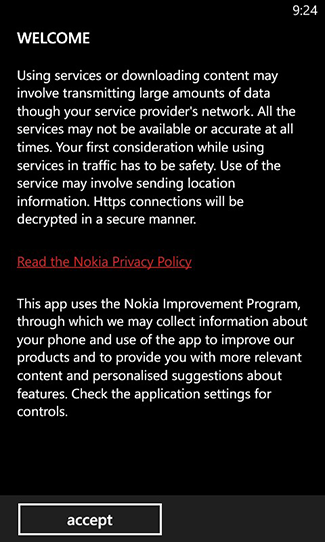 Apparently, Nokia browser on Pandya’s phone, and Nokia Xpress on Windows Phone 8, translate your requests to secure sites into requests to the Nokia proxy server before it ever leaves your phone. Commenters on Pandya’s post have been arguing about whether this constitutes a “man-in-the-middle” or not. I suppose that it’s more of a “man-in-the-client” that supports the second “man-in-the-middle” on the proxy. Is that what’s really happening? Isn’t this the same as what Opera Mini is doing? There is an increasing trend to build simplified browsers for mobile devices in which optimizations are done by a proxy server. Silk for the Kindle Fire is an example, but Silk doesn’t perform proxy decryption of SSL connections. Opera Mini is another example. Opera Mini is a version of the Opera browser, designed for lower-performance mobile devices, that sends all traffic through Opera proxies. These proxies do extensive pre-processing of web pages, and return a highly optimized version of the web page via a standard called OBML. This includes SSL traffic, for which there is a similar “man-in-the-client” that sends SSL-destined traffic to the Opera Mini proxy encrypted with keys that the proxy knows and can decrypt. Opera got significant flak for this, and has since gone out of their way to explain on their web site that “If you do not trust Opera Software, make sure you do not use Opera Mini to enter any kind of sensitive information.” However, when I installed the Opera Mini browser on my phone, I wasn’t pointed to those warnings. I saw the Opera Mini EULA, and the Opera Mini Privacy Statement, which do not include such language. So, as opposed to Nokia, Opera has made an effort to alert users to the browser’s SSL decryption–although I think they could do much better. Opera also may have a more compelling case for why they need to do this interception. Their browser only understands OBML, not HTML. It wouldn’t know what to do with the HTML contents of a non-intercepted SSL connection. It’s not clear to me how Xpress works internally, but the user-agent coming through their proxy declares it to be a Gecko-based client, which is built to render HTML. To be clear, I think that any “man-in-the-client” SSL interception is a bad idea. I don’t think that engineers should sacrifice security in the name of efficiency in this case. If it’s not possible to maintain end-to-end encryption with the given technology, then the engineers need to think harder about how to tweak the technology to make it possible. However, where it is done, it’s clearly better that it is prominently disclosed. What does Nokia Xpress communicate to the end user about all of this? 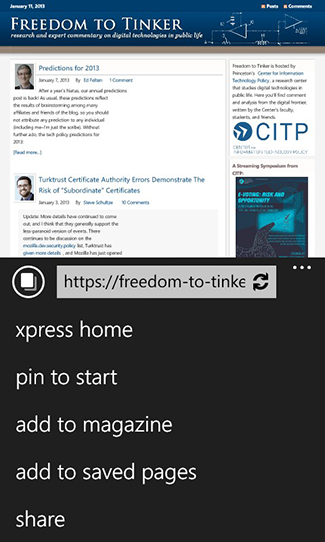 When installing and using Nokia Xpress, I took the following two screenshots. The first is the initial user agreement page, which as of 9:24pm Eastern time last night included the somewhat-cryptic sentence, “Https connections will be decrypted in a secure manner.” I wonder if this is part of Nokia’s attempt to “review the information provided in the mobile client in case this can be improved,” and I wonder if this sentence existed a week ago. It’s certainly not transparent what they are referring to, and as an end-user it would not be at all clear to me what this means. Which HTTPS connections? I would expect that the client would decrypt my HTTPS communications with Freedom to Tinker in a secure manner, but I don’t think that’s what they intended to convey. At such a high level, these may seem like a no-brainer. They are no surprise. That being said, specific cases like Nokia’s SSL decryption are quite surprising indeed. If you think about it, any Content Delivery Network (CDN) is doing the same since many years. It is easy to realize this when using the CertificatePatril Firefox extension, that keeps issuing warnings of changing CA when connecting to the same web site. The warnings are often due to the CDN. The Nokia stuff is entirely different. The client software is mangling SSL requests in order to send them not as normal SSL requests but instead as Nokia-readable encrypted requests, which are indeed decrypted at the proxy. This breaks end-to-end encryption. A major problems in the mobile device world is that a single vendor may play most or all of the following technical roles in the supply and service chain: (1) specifying the hardware, (2) customizing and installing the OS, (3) customizing and installing the default browser and mail programs, (4) acting as the supplier and moderator of all other “app” software, (5) acting as Internet service provider, (6) acting as firewall/proxy server, and (7) now we know, acting as certificate authority. In the PC world these same technologies and services are generally provided by different companies, and there is some competition and choice in each of them so that the user can at least in principle make those choices. But there is severe vertical technology integration and very limited competition in the mobile device world that largely prevents that kind of user control and choice. Under those circumstances it is hard to argue that anything you do on a mobile device can be secure against threats from whatever company dominates the software stack and service provision of your device. Without a standard allowing the client to request compressed/bandwidth-optimized content directly from the server, HTTPS MITM is the only way to reduce the amount of data transmitted to the client. It’s a tradeoff that is reasonable in many cases where the information is not especially sensitive, and considering that many websites encrypt by default even when there may not be sensitive data. So long as the user is aware, and the server-side implementation is secure, this isn’t much worse than the trust the user places implicitly in browser manufacturers by their choice of certificate roots bundled into the browser. Perhaps it is acceptable if the user is aware, if the user has the ability to opt-out, if the host site is also aware, and if the browser vendor is exercising reasonable care (perhaps backed up by audit and/or third-party security testing). Perhaps. As a broader policy matter, creating another point of potential security failure while doing non-standard things with HTTPS seems like a bad idea. I understand the idea of a performance tradeoff, especially in the case of less powerful “feature phones” on slower networks, but the trend to push these “thin” HTTPS-hijacking browsers into high-powered smartphones on high-speed networks seems extremely short-sighted.